The time for getting prepared is over, winter is officially here. However, you can still do some DIY (do-it-yourself) maintenance with the help of Fall River auto parts at services at LaCava Brothers Auto Supply to ensure you are ready for just about anything that winter can throw your way. Safety is a very important part of car ownership, so it pays to take time to do all of the services necessary to keep your vehicle in good running order. Regular inspections of essential systems, taking time to install new brake pads and use rotor turning services when applicable, can help to give you the stopping power you need in snow and icy weather. Living in the northeast means paying attention to the local weather and keeping an eye on what’s coming next. Be prepared for winter storms and heavy snowfall by keeping smart winter supplies in your vehicle. De-icing chemical, shovels, ice scrapers and rock salt can all be very helpful if you get stuck in the snow. Unconventional items, such as kitty litter, can also be used to help improve traction and get you back out on the road. In addition to having a first aid kit and all of the emergency supplies stowed safely in your trunk, it also pays to take care of preventive maintenance tasks at home on your own or through the options available at your local Fall River auto parts and services store. 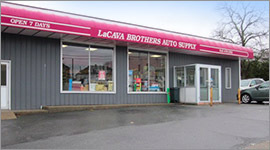 LaCava Brothers has supplied auto parts and services to the Greater Fall River area for over 70 years. Family owned and operated, the LaCava name means quality in the local region. So whether you need parts to install new brake pads or want to see if rotor turning services are right for your vehicle, you can trust our local Fall River auto parts and services store on Bedford Street. We serve local customers, as well as businesses and commercial clients with our full line of foreign and domestic parts. We will even order hard-to-find auto parts and have them delivered to your door. Anyone who lives in a cold climate needs to know about antifreeze and windshield washer fluid. If you use the right fluids from LaCava brothers, you won’t risk freezing. 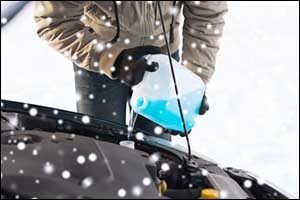 Antifreeze is an essential fluid that goes into the radiator and it protects your car during the winter. A mixture of 50 percent water and 50 percent antifreeze should always be in your vehicle. Make sure that the level is full. If you have a used vehicle or aren’t sure about the mixture, you can get the fluid tested or purchase a tester for under $10. Springtime radiator flush and fills can go a long way toward ensuring that your vehicle has the fluids it needs to prevent freezing. Windshield wiper fluid is the only thing that you should ever put in the reservoir for your windshield wipers. Water will freeze, but windshield wiper fluid is designed not to freeze. You will need it this winter as you attempt to navigate slushy or slippery roads with any type of precipitation or blow off from other vehicles around you. Take a peek at your wiper blades when you check the fluid to make sure they are in good working condition. When is the last time you checked your tires? Make sure you check out the depth of the tread and check the tire pressure regularly if you don’t have an automatic monitor in your vehicle. If your tires are worn, losing tread or need to be filled up with air regularly, ask the experts at your local Fall River auto parts and services if you should replace them. Depending on the type of driving that you do and where you live in the Southeastern Massachusetts or Rhode Island area, you may also want to invest in a set of snow tires. Find out what you need before you invest money that you might not even need to spend. In addition to freezing fluids, tires and emergency kits, make sure to check the “usual suspects” of automotive prevention, such as the engine oil, battery charge and posts, spark plug wires and brakes. If your brakes need attention, make sure to install new brake pads right away and change out your rotors or come to LaCava Brothers for rotor turning services. Give us a call at 508-676-1951 to schedule services or to learn more about all of our Greater Fall River auto parts and services.